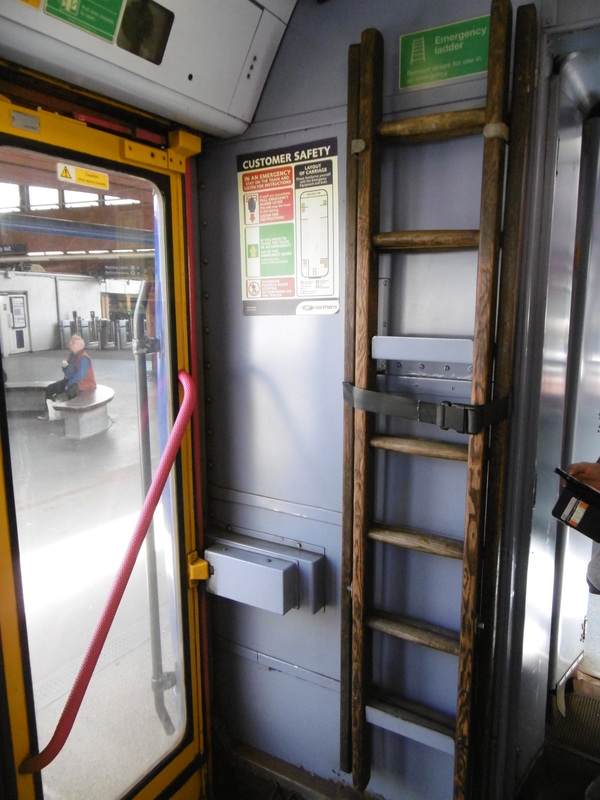 Do you think northern England’s railway system need some investment? We went by train – 35 miles or so as the crow flies. More than an hour and a half, on a Sunday. 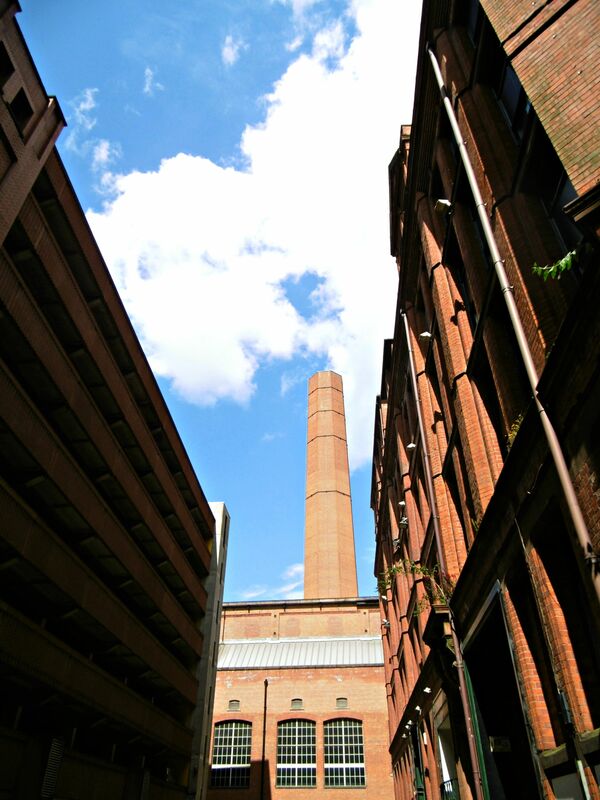 An interesting journey, chugging past lonely chimneys, their factories long gone. Well, mostly. ‘Uncle Joe’s mint balls keep you all aglow,’ proclaims the slogan on one near Wigan station. Still hand-made, over gas fires, as they have been for over a century. Eventually we’re in Manchester, checking in at a luxury hotel. The Radisson Blu Edwardian. Ascending in the lift, serenaded by Pan Pipes, I’m half expecting jungle vines to start curling down around me. The room’s serene and minimalist. Devoid of clutter such as printed matter. Except for door labels and laundry lists from The Radisson Edwardian London. Pity the disoriented international traveller. Well only if he has no idea where he is or how much breakfast round here costs. Anyway, as the red plaque on the outside of the building tells anyone who walks past and looks up, this is – was – the old Free Trade Hall. The hotel now rises like a tall, sharp, shiny alien behind its remnant facade. 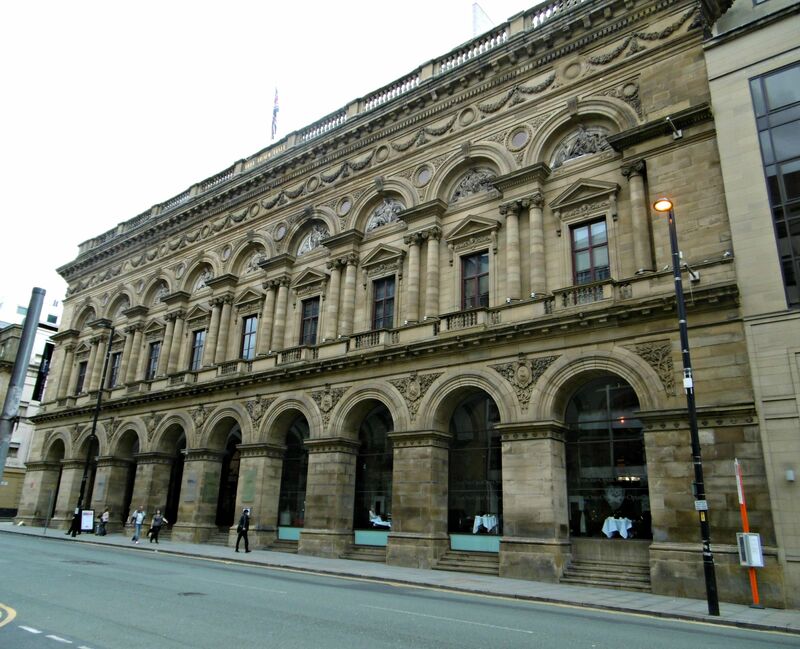 The Hall, built between 1853 and 1856 in the ‘palazzo’ style, stood on the site of the Peterloo Massacre. Funded by public subscription, it celebrated the repeal of the Corn Laws which had caused such hardship to working people. Facade of the old Free Trade Hall after the sun went in! It was damaged in World War II. Manchester, hub of the world cotton trade until the 1960s, suffered heavily. My mum and dad talked of standing on a hill in Blackburn (just over 20 miles away), watching, horrified, as Manchester burned. Rebuilt in the early 1950s, the Hall’s civic life was terminated in 1997 when the city sold it to a developer. In 2004 the hotel opened. 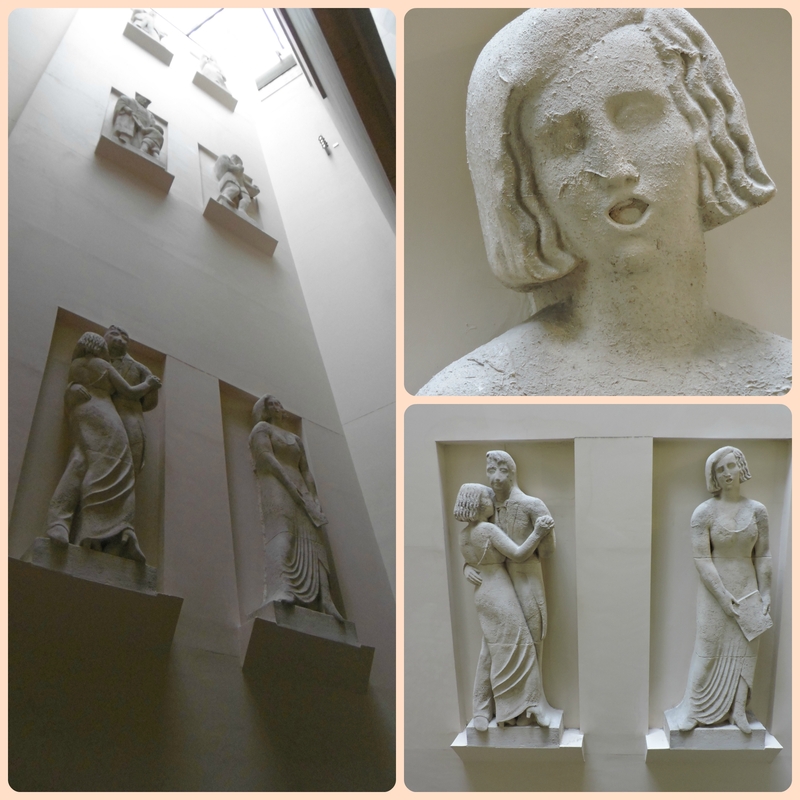 As well as the façade, they kept a series of stone statues that was added during the 1950s rebuilding – but they’re not anywhere obvious. 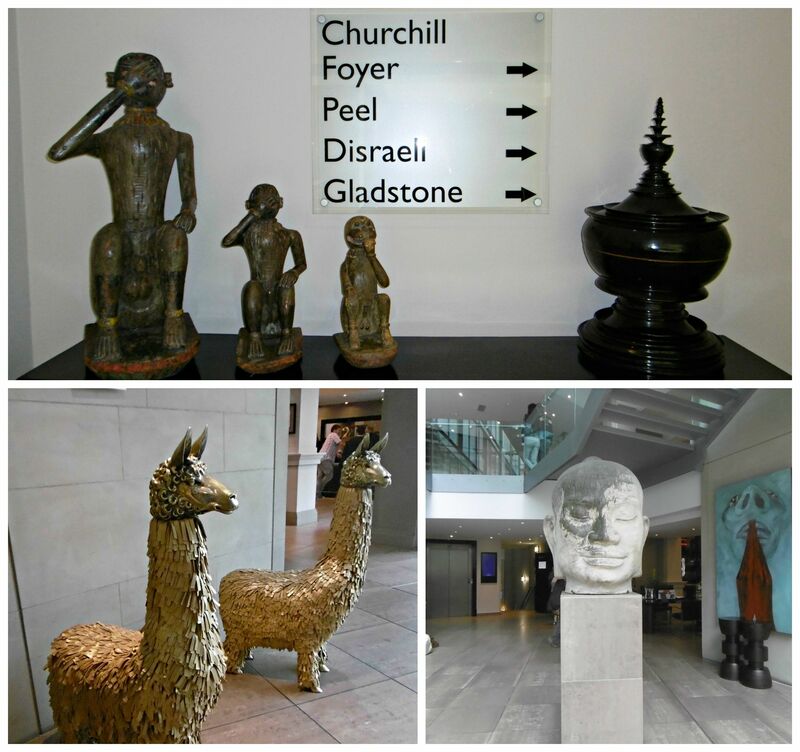 Obvious is left to the décor: two gold llamas, a giant oriental head, three wooden monkeys. Relevant and appropriate artefacts? Hmm. I ask the young woman behind reception about the statues. Seems they’re in the stairwell down to the spa. So we descend, only to find they’re in pairs going way, way up to the top of the building. After climbing three floors for three better views, it becomes more difficult. We give up and leave – because it’s time for our guided walk. Down a side street the new British citizen reckons a crowd is gathering. I pooh-pooh that – obviously it’s a queue at a bus stop. But some forty minutes later, our walk reaches the very same spot. And it’s a crowd. A few men are wearing red bobble hats – ‘Liberty bonnets’. Socialist banners lean against walls. Singers, guitars, dogs, people bask in the warm sunshine – or is it the celebrity afterglow? We missed two well-known actors, orating. We’re now standing on what was St Peter’s Field. I peer around seeking a memorial. In vain. So far all we’ve seen is some small red stars commemorating victims’ names, in the floor linking the central library to its extension. Next we reach the red plaque on the wall of our hotel and gather – uncomfortably – around a seated beggar who soon moves on. Us? Or the policeman heading our way? 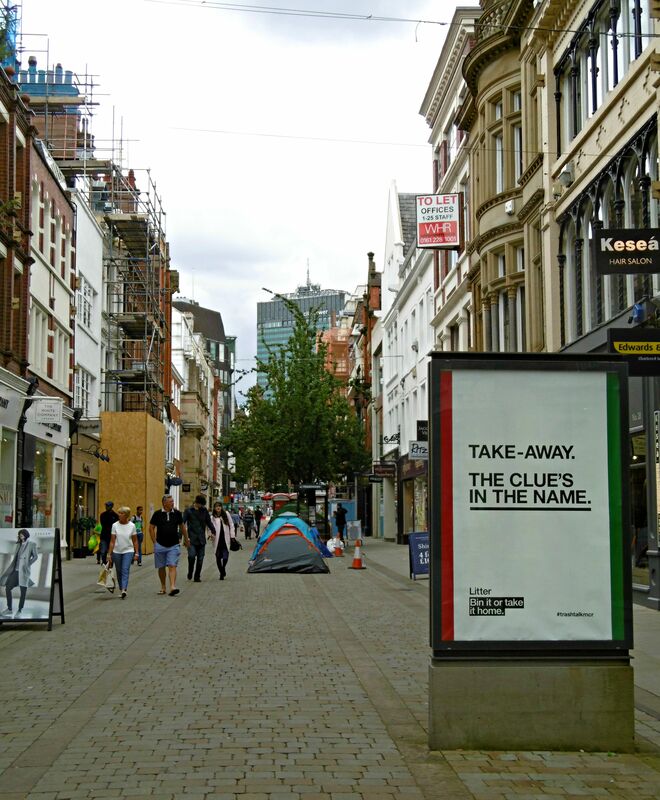 In a smart shopping street tents are pitched. Demonstrating against homelessness. Or demonstrating homelessness? Whatever, demonstrating. The guide points out the wall of the Friends’ Meeting House, there when Peterloo happened. 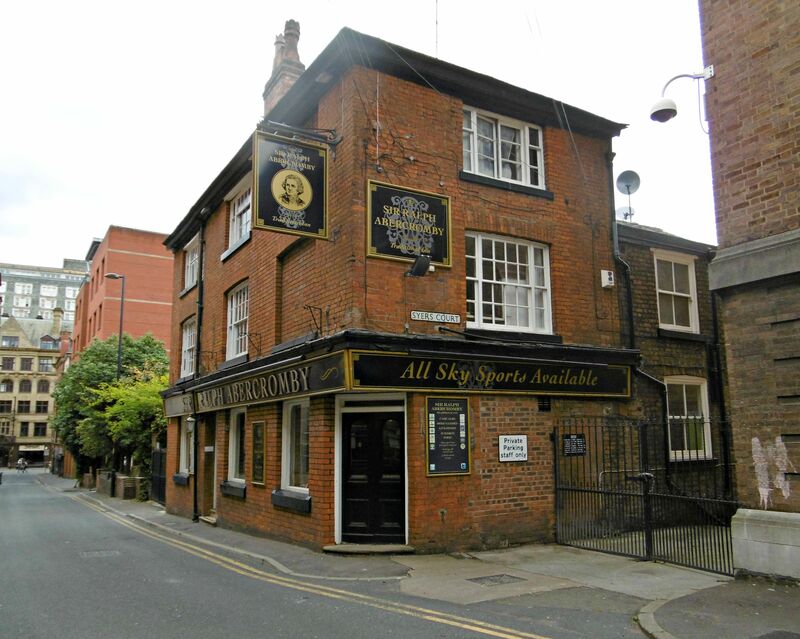 A few minutes later we reach a whole building that was there – now a pub, supposedly haunted by victims. A developer wants to develop it. Is there any memorial on it? There’s a pattern developing here, Manchester. And we adjourn to the pub. Support it while we can. Over a half of Cheshire pale ale our guide recommends the People’s History Museum – and we leave for an evening of Italian food and wine happy in the knowledge that Monday will bring another new experience. Two rain-free days in Manchester. The spirits of the radicals must be smiling on us. For this is the rainy city where Marx and Engels met, the city of which de Toqueviille and Mrs Gaskell wrote. We trudge the wrong way down a main street, past a statue of Chopin (he played here, once) then have to ask directions. Among the many signs directing tourists, it seems none point to the People’s History Museum. Eventually we arrive. We’re given a map, told what’s on and – oh, by the way, one of the Labour leadership election hopefuls is talking right now. We sneak in, stand at the back. 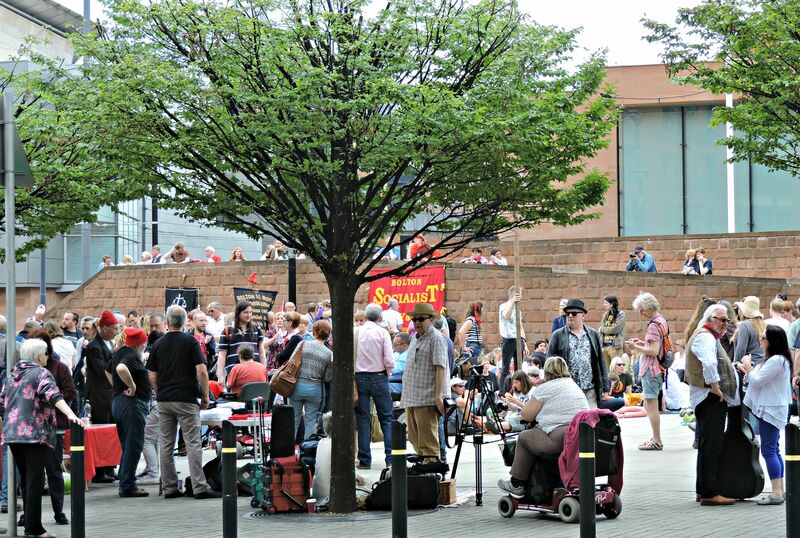 I can’t say the atmosphere’s electric, as it was in Liverpool for Jeremy Corbyn. 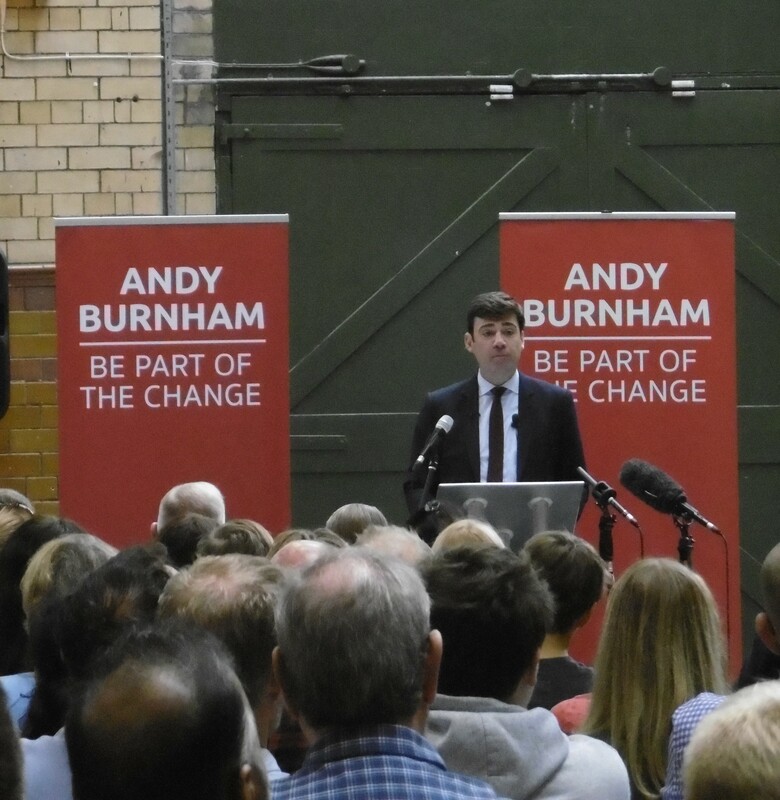 Andy Burnham seems smaller in real life. Gives the impression of being made-up (I mean with make-up, not imagined, or just chuffed). He tells us he agrees with Jeremy about lots of things – but would be better at uniting the party. And he gets a (mostly) standing ovation. I sympathise, but don’t think he’s the man for the job. Upstairs I peer into the gloom – created by sombre lighting – and suppress a groan. Lots of ‘open this’ exhortations. I’m not sure I can take it. But, a considerable time later I’m sorry to reach the exit. The tea room and a warm scone win out over an exhibition on the miner’s strike and we leave Manchester with minds and waistbands stretched. A sense that ‘the great and the good’ who run Manchester don’t think that their proud, long radical history is good for … well, business. I’ve also checked the Radisson Hotel website. After an exchange of emails with them I can see they have already added some historical details to their home page. Well done Radisson! A new leaflet next? This entry was posted in Art, jaunts & going out, Britain now & then and tagged Andy Burnham, Chopin, de Toqueville, Engels, Manchester, Marx, Mrs Gaskell, People's History Museum, Peterloo, Radisson Blu Edwardian, Shelley's Mask of Anarchy. Bookmark the permalink. As it said (do pay attention dear!) in the stairwell to the spa (and up several floors too). Hence the picture looking up. 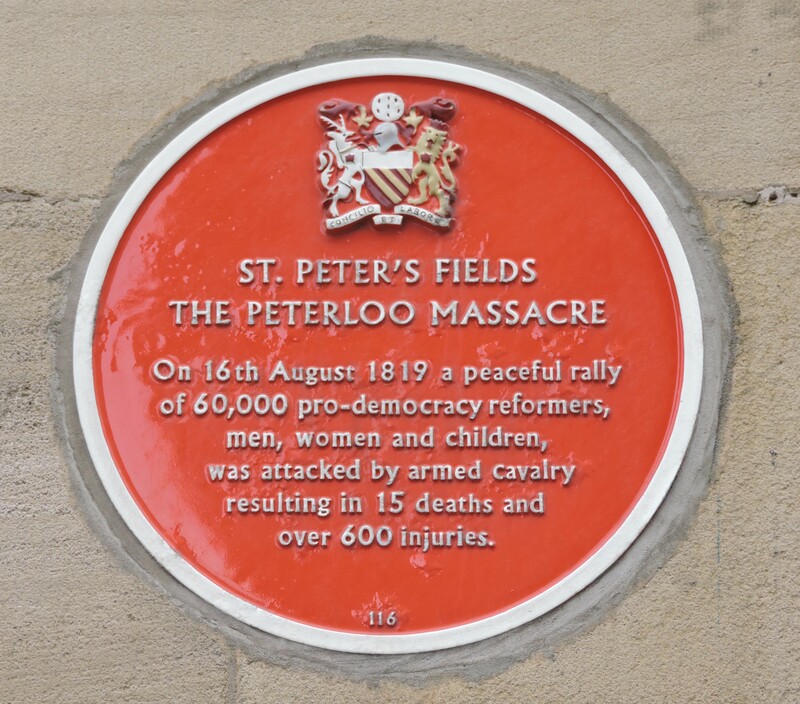 The Peterloo Memorial Campaign has been campaigning for a respectful, informative and prominent memorial since 2007. 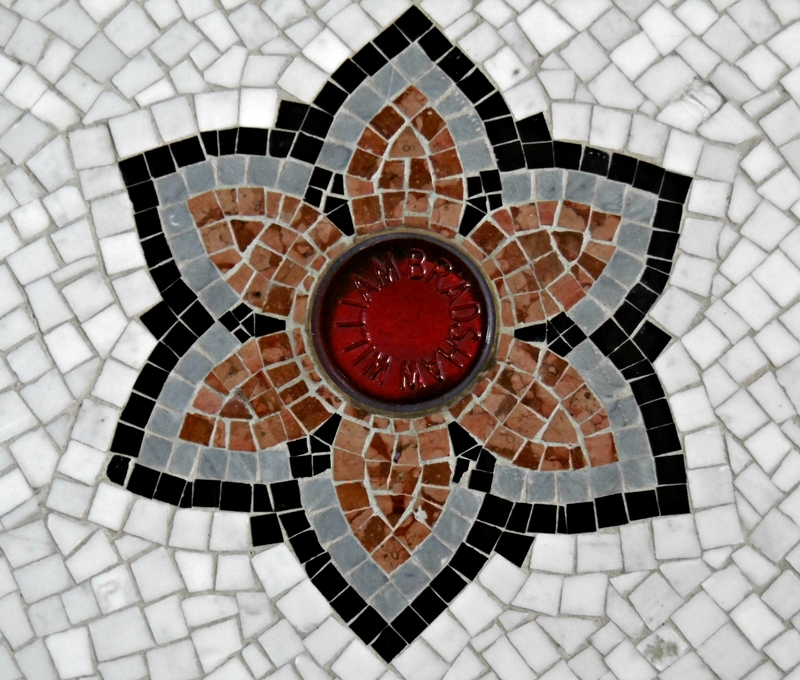 The council has promised to provide a memorial by the Peterloo Bicentenary in 2019, but we continue to lobby to make sure that it meets our criteria. Hi Harriet – yes, I know and fully support you – regularly check your website & now follow you on Twitter too – sorry, should have thought to put in a link! Will do so next time I am editing. Thanks very much, not complaining – it’s an opportunity to publicise our campaign! Done! Added at the end before mention of the Radisson. Good luck and I will follow with interest. Thank you. I’m glad you liked it. I was intrigued by and enjoyed your Bronzed. Red. Feverish! I try to avoid Manchester…. Ah, straight to the most important thing! I was going to include it but it was getting a bit long. The meal was very good but the restaurant very empty (City was playing) and we rejected the waiter’s advice on wine and turned down the offer of pudding and asked for the bill. But he came back with not only a huge tiramisu for the two of us to share with hazelnut ice cream (heaven? is that what they eat in heaven?) on the house – but also a large glass of the wine he’d recommended – we’ll go back if ever we’re there again! Mmm. 🙂 And re the sat nav thing – we didn’t even attempt driving after last time we went by car – train all the way.City driving is awful. Oddly enough, with reference to empty restuarants, we took the children to Warwick castle a few weeks ago and in the evening we met up with some friends (over from the US) in a lovely French restaurant called ‘7 square’. My friend thought I’d booked the whole place just for his visit as the seven of us had the entire restuarant to ouselves for the whole evening. It was not a sign that anything was wrong as the food was glorious and the service exceptional. Apparently Sunday evenings in Warwick are always quiet! Read Land Rover Missus’s piece and loved the view from the window! I presume it was horribly expensive – don’t worry I’ll find out for myself, no wish to embarrass you here! Sherry trifle – I’m a no-jelly trifle person, how about you? Red liberty bonnets sounds so much better than red liberty beanies as we’d call them here. I love that the Radisson has utilized an historic building… I wonder if that’s their predominant style as in Sydney both are in old buildings. So much better than new and shiny. Last week in the country we spent a night in a new boutique hotel recently refurbed from an old working mans pub I last visited in 1983…done very nicely in the original Deco style. Much better than the other offerings in town. I’m pleased your input has informed Radisson re the historical value… such things can get lost if people don’t have the awareness. The Sir Ralph Abercrombie pub looks marvelous, a shame to lose it. Happens far too much and incrementally we end up with generic… and then the traveller truly wouldn’t know one city from the next. Case in point, in some parts of commercial San Francisco it felt a lot like Sydney, and in Darwin the new hotels looked like any you’d see elsewhere. Exactly – bland world. The fact that the Radisson’s leaflets and labels said London though was just beyond the pale as far as I’m concerned! 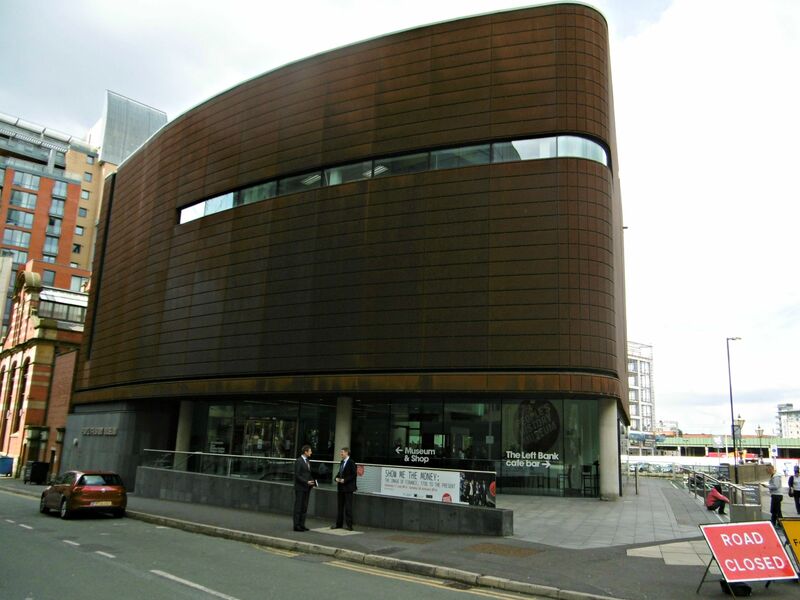 I’d certainly rather a bit of a building was retained than none but Manchester seem pretty bad at safeguarding the heritage of his particular very important historic event – it feels as if the city’s proud businessmen are embarrassed by it. The pub I was told is not protected in any way and it’s likely if the planning permission is granted it will just be demolished. In that case the only thing left around the original St Peter’s field from 1819 will be the wall of the Quaker Meeting House!